BOTTOM LINE: The ways racism, sexism, homophobia, and sexual violence impact inner-city youth find expression in this timely, if somewhat predictable, look at the ways the personal and political converge in individual lives. The Wonderland that is home to the nine young men and women – and the Goddess Ate – in Vinny Eden Ortega’s Hopeless is a place of misery and degradation, as far from a fairytale wonderland as one can imagine. Teachers see themselves as babysitters, and expect their students to rob stores, deal and use drugs, and get pregnant as teens. Heroin is easily available, sexual violence is endemic, and drive-by shootings are common, leaving person after person grieving and pained. It’s a horrible place. When Wonderland newcomers Van (Carlos Allen Reyes) and his big sister Ren (Renee Adrienne Vito) suddenly find themselves in this hell-on-earth, they quickly try to adjust and adapt. Van can’t and begins to fall apart while Ren adopts a steely veneer and hooks up with Damien (Cole Taylor in the production’s best performance), a drug dealer and one-time math prodigy. Damien’s story is sadly familiar. As it unfolds the audience learns that his education ended abruptly after his 38-year-old mother was accidently killed by a bullet intended for someone else. Hopeless exposes many similar tragedies, each one a distinct piece in a series of short, and somewhat disjointed, vignettes. 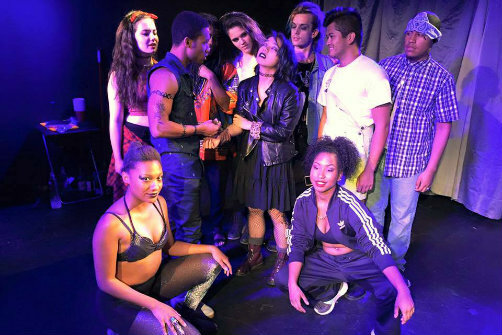 There are no sets, although recorded music – and a few song fragments sung by Ren, Damien, and a Lady of the Night named Kat (Ashley Scott, who also showcases her tremendous abilities as a dancer/choreographer) – break up the dialogue. Their struggles are enormous, and their efforts to retain some smidgen of humanity are valiant. That said, there are no regular folks in Wonderland, no working people, community volunteers, or peacemakers. In fact, the play does not include a single life that has not been marred by horror or loss. This makes Hopeless less credible that it could have been. Had Ortega presented the community differently, and allowed the leaven of men and women whose everyday lives have rhythm and rhyme, ghetto life would have been more realistic and less relentlessly grim. Despite this, however, the play is nothing short of a sucker-punch. Part of this is due to The Players, five cast members who periodically emerge to tie each individual story to a larger political narrative. By reciting the by-now familiar names of Eric Garner, Freddie Gray, Akai Gurley, Trayvon Martin, Renisha McBride, Tamir Rice, and the nine targets of Dylann Roof’s rampage at the Emanuel African Methodist Episcopal Church earlier this month, Hopeless reminds the audience that racism is front and center in America, a constant backdrop that limits what many youth of color believe is possible. It's also a form of hatred that is intertwined with homophobia, classism, and sexism; as such, Hopeless calls out bigotry of all kinds and is a fervent prayer for peace and social justice. Yes, Hopeless is heavy handed. Still, by directly engaging with contemporary issues, it reinforces several timely injunctions. Lest we forget: Whether we’re female, queer, low-income, or of color, our lives are of equal value and matter.